The home services industry is continuing to grow every year. Many home owners are choosing to renew or restore their homes instead of buying new. With a proprietary 3-step process to clean and restore exterior surfaces, Renew Crew has continued to grow in profitability. Jessica Kelman, Renew Crew's Franchise Recruiting Consultant, sat down with us to talk about the home maintenance industry and why Renew Crew is the leading exterior surface cleaning business. Can you provide us with an overview of your industry and why it's a great industry to start a business in today? Renew Crew is the undoubtedly the leader in exterior surface cleaning and protecting. Cleaning and protecting outdoor surfaces is an important part of home ownership and part of an estimated $476 billion home maintenance market. Even better for our franchisees, these homeowner maintenance obligations must be done regardless of how strong or weak the economy might be, thereby providing a recession resistant revenue stream. Most importantly Renew Crew provides a comprehensive suite of services to assist American homeowners to protect and maintain their most important asset their home. Renew Crew offers ongoing maintenance programs to ensure that their client's homes stay looking clean all year. Not to mention, generating an attractive recurring revenue stream for our franchisees. All of this combined provides our clients with an unforgettable, world-class experience unmatched in the industry. What trends do you see in the home maintenance industry over the next few years? As pavers become an increasingly popular choice for outdoor living areas and consumers begin to create a demand, we will start to see fly-by-night paver sealing businesses pop up to make a "quick buck'. We saw this trend happen in the wood sealing industry in the late 1990s. This influx of "businesses" in the industry increases consumer awareness that it needs done and makes it easy for our professional brand to win over the clients we spend our marketing dollars trying to attract. 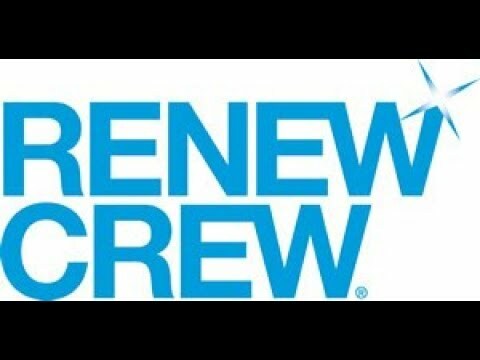 What makes Renew Crew stand out in the industry? Renew Crew's unique 3-step proprietary process sets us apart from the competition. We take cleaning one step further and apply a protective coating. The surface stays cleaner longer and makes it more stain resistant. The systematic procedures, tools, and techniques we developed throughout our 20 years of experience were designed to save time resulting in more profitability for you. All of Renew Crews proprietary products are environmentally friendly and specially formulated for the surface they are applied to. The thick foam cleaner clings to vertical surfaces allowing the cleaner to do the work as it soaks in and emulsifies and removes embedded dirt, mold and mildew. The cleaning products allow us to clean using less pressure avoiding damage to the surface. Every point of contact a customer has with Renew Crew delivers a professional image beginning with the initial phone call. The website, wrapped vehicle, marketing materials, proposal forms, sales staff as well as our technicians all reflect the world class brand we are. Our goal is to deliver excellent customer service exceeding their expectations. Describe the working environment for a Renew Crew franchisee. Most of our franchisees prior to becoming a part of Outdoor Living Brands, started out of their homes. As their businesses grew and the need for more space became apparent, they moved into a small office or retail spaces. Some of our new operators are adding Renew Crew as another profit center to their existing business. Those operators are running several businesses out of one location, thus being able to share on overhead cost. How much experience in the industry should a potential franchisee have before they consider your franchise? No experience is required. As all new franchisees go through a week long training process, including ongoing phone support and on-site guidance and training. We also created a suite of tools to support the daily operations of the business. They include a full enterprise service platform (e.g., CRM, field operations, accounting integration, etc.) that will allow you to manage daily workflow, from marketing to the initial customer call all the way through invoicing and collection of receivables.